We’ve had a few flowers in the gardens right through January (perennial wallflower and red deadnettle) and February (winter aconites, snowdrops and crocuses), which has provided some nectar for bees flying on warmer, dry days when there hasn’t been any wind. Now, as the days begin to get longer and slightly warmer, the pulmonarias have started flowering, and will continue for several weeks. 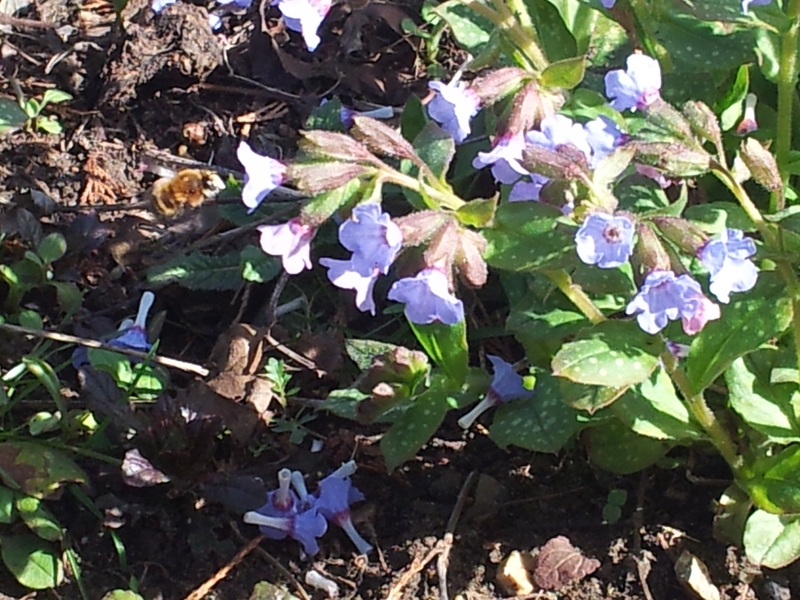 Bees love them, and seem to visit them in preference to anything else that’s flowering at the time (it’s so difficult not to keep writing “make a beeline for” on this blog, but watching bees approach all the flowers, then making straight for the pulmonaria, you can certainly see where the phrase came from). We grow a few clumps of one of the darker blue forms (Blue Ensign), as well as the common pulmonaria with both pink and blue flowers. It’s a common plant that’s grown in many gardens round here, thriving on the local heavy clay. It prefers cool, shady places, ideally with rather more moisture than we have at the Memorial Gardens, but it’ll thrive pretty well anywhere. The only problem is that if the plants get too dry their leaves become mildewed, which can be unattractive, so we grow several clumps of them near the comfrey to provide them with shade in summer, or at least hide the leaves till we get round to cutting them off. 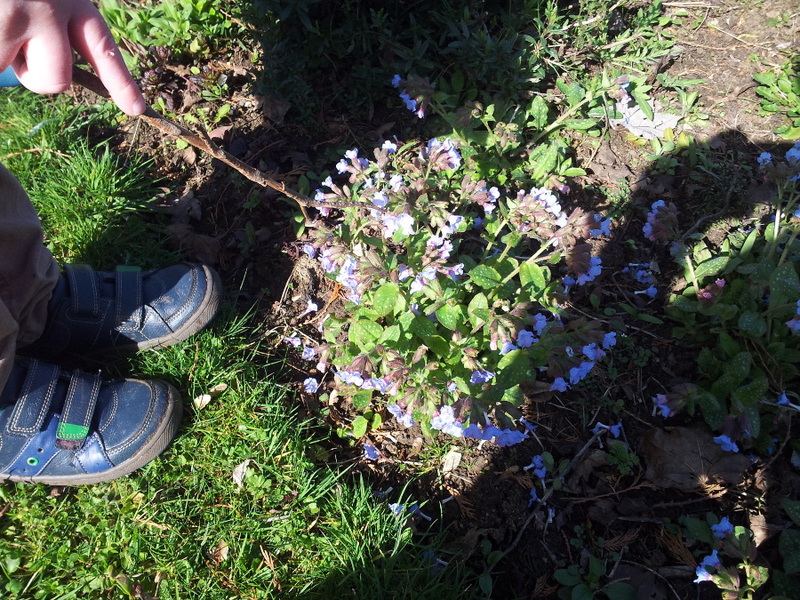 Here’s one of the children from the local preschool, taking time out from sowing peas to point to the pulmonaria. And here’s a bumblebee on one of the clumps earlier this week. This entry was posted in Uncategorized and tagged bee magnet flowers, local preschool on March 17, 2017 by Pippa Sandford. In the autumn (http://www.linsladememorialgardens.uk/2016/11/10/ready-for-remembrance-day/) we explained that we leave stalks and seed heads over the winter for insects and other wildlife, and we mulch the ground, to protect the soil over winter. Usually we look forward to clearing all the dead growth away in spring, and removing the mulch, and someone walking through the gardens last week when I was working there asked me when this spring clear-up was going to happen. 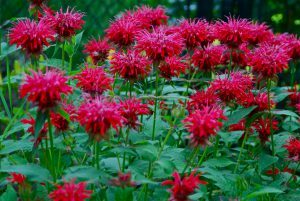 I must admit I’m itching to get on with it, but we’re being very cautious this year, as last year in our zeal to tidy up, we cleared away a lot of shoots of perennial plants we didn’t recognise, like this bee balm (Monarda didyma). 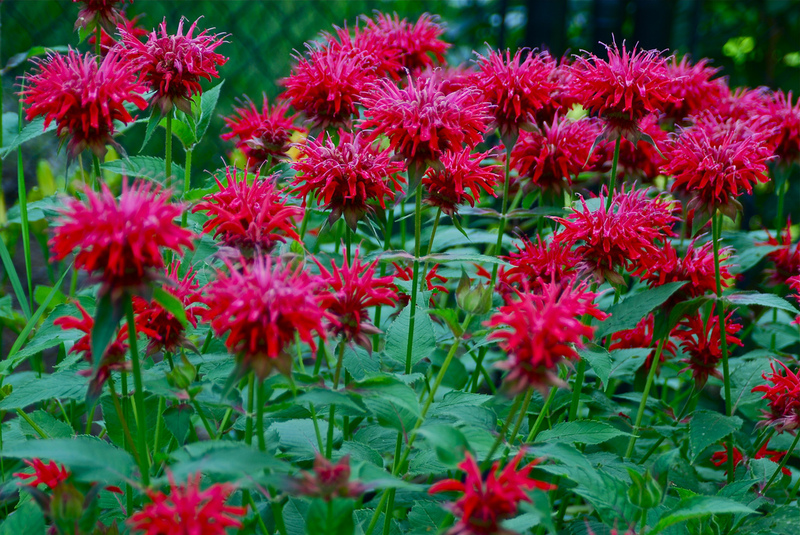 It’s a very handsome plant, with bright red flowers later in the summer that bees just can’t resist. There are many other perennials just coming through, as well as seedlings of flowers like California poppies that were very popular last year (with bees and passers-by alike), so we’ve decided to postpone tidying up for a couple more weeks. We’ve cleared away a lot of the conifer twigs that were blown down by the storm a couple of weeks ago, and we’ve cleared some areas between plants that we do recognise. So we hope the beds don’t look too untidy, and we hope you’ll just enjoy the pulmonaria, currant, red deadnettle and primulas, and turn a blind eye to emerging weeds for just a little while longer! This entry was posted in Uncategorized and tagged bee magnet flowers on March 17, 2017 by Pippa Sandford. This wild flower doesn’t look very important, but it’s one of the few plants that may be in flower at any time during the year, which is good news for any bees out flying on warmer days during January and February as it’s one of the few sources of nectar for them at that time of year. 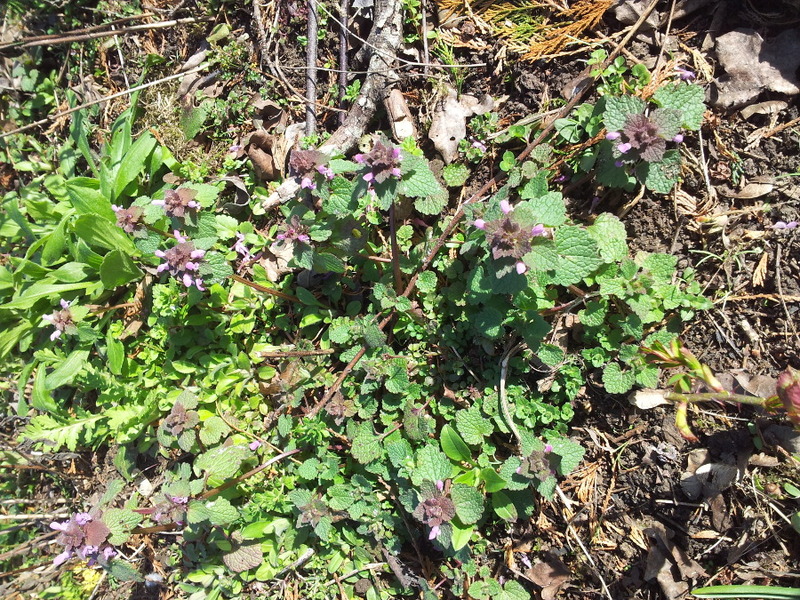 Although it’s usually classed as a weed, it’s not too invasive, and it’s pretty easy to remove if we want to – unlike the white clover and self-heal that took us most of last year to get under control – so we tend to leave it unless we really need the space for something else. Here’s one of the clumps near the comfrey in the third bed down from the car park end, surrounded by twigs and bits of conifer that blew down in the storm last week.